3.8.1. Road structures. Rules for drawing and adding attributes. 3.8.2. Parkings. Rules for drawing and adding attributes. 2.7.4.1. Composite polygonal items: drawing techniques. 2.10.6. Item: undo edits, submit complaint to moderator; delete item; item reference). In Turkey, “speed” can not be displayed on the map. Users can not perform any operations with these items. This section describes techniques and rules for working with “Camera” items of the “Road infrastructure” category. The intersection where the camera is located. Sections of road that are monitored by cameras. That's why the camera can only be drawn after the road sections that it affects have been completely drawn in. The types of “ fixed speed cameras” indicated above (and their dummy equivalents) should be assigned the “Camera” type in the Road infrastructure category on YME. — should not be drawn (these items will be deleted from the map). 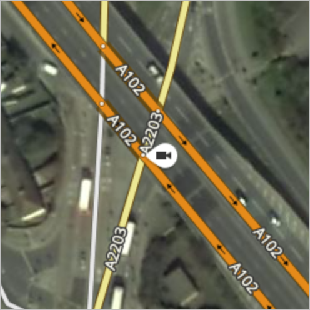 Each camera item on Yandex Map Editor corresponds to one direction of filming and one type of traffic violation. Enter the section of roadway before the point where the camera is located to indicate the filming direction (even if the camera captures cars as they are driving away from that point). If a camera is two-sided, then you must draw two cameras at that point in the road. If a camera captures two types of violations (for example, if it monitors speed and lane distinctions), then you should draw two cameras at that point in the road. 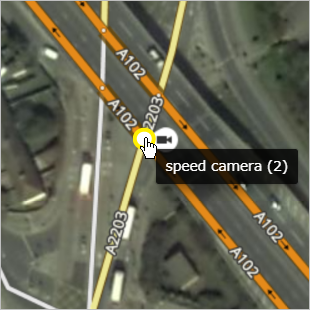 Draw paired cameras that measure average speed as separate speed cameras. So if there is a two-sided camera that records violations of two types, you should draw four cameras. 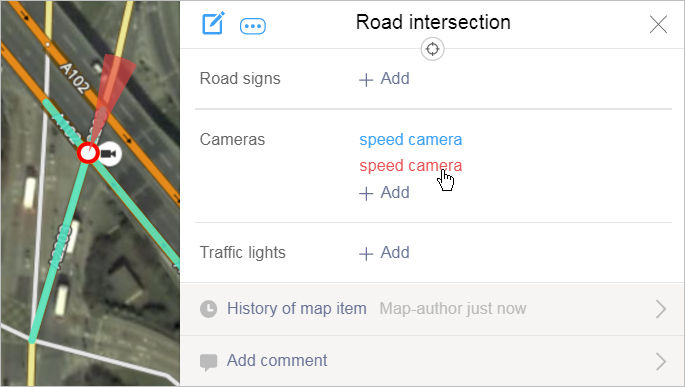 In the map item category menu, select Road infrastructure → Camera. The Camera panel will open. Click the intersection the camera should be set on to select it on the map. If an intersection was not created earlier at the place where the camera should be, then this intersection will be created automatically. From the list in the Camera panel, select the type of monitoring that the camera (Speed monitoring, Lane monitoring, or Traffic police checkpoint. The Redraw button will be added to the toolbar: . When you click on it, the data you entered will be deleted and you can add the camera again. If you need to move the camera you're redrawing to a point where there is no intersection, then you need to create an intersection at that point ahead of time. If you need to move the camera you're redrawing to a point where there is already an intersection, then you don't need to prepare it ahead of time. When you add a speed camera, you must enter a value for the Speed limit attribute for the section of road that the camera monitors. If the camera you added has a time restriction (i.e. it isn't in effect 24-hours a day), then enter this information. In the attribute panel that opens, click Camera and then Add time limit. Time: time when camera starts and stops running. Enter time using the <HH:MM> format. For example, enter 8:00 am as 08:00, and 8:30 pm — as 23:30. If the values of the fields are not entered, then the condition will always apply. During period: date when camera starts and stops running. Enter dates using the <DD:MM> format. For example, write April 1 as 01.04, and November 23 — as 23.11. Weekdays, days of the week, and weekends — check the appropriate boxes. All boxes are checked by default; if a camera does not record every day of the week, then uncheck the appropriate boxes. For example, if a camera only records on weekdays, then uncheck the “Weekends” boxes. If a camera records during a few different time periods (that differ, for example, for weekdays and weekends or for different calendar periods), then click twice on Add time limit to open a second field where you can enter time restrictions along with the appropriate values. To delete an extra time restriction entry field, just click (Delete). Several cameras can be linked to one intersection (if there is more than one type of camera or the cameras are recording traffic in different directions). To edit an item, click Edit in the Camera panel that opens. On the item's attribute panel, click Save . You can use the Undo edits button to return an item to the condition it was in before you started editing it (all the way back to the condition it was in when it was last approved by a moderator). If the item was created recently and still hasn't been approved by the moderator, then undoing edits will result in the item being deleted. Only moderators have access to the Delete operation that lets them delete an item. YME users can delete items they created in error by undoing their own edits until the item disappears (if the item was just created and it was not approved by a moderator yet). If an item that was created earlier and already approved by a moderator needs to be deleted, you must report it to the moderator. The process for undoing edits is described in section 2.10.6. Item: undo edit, report to moderator, delete item; get link to item. If an item was already approved by the moderator, then undoing edits will return the item to the condition it was in when it was approved. In this case users cannot delete an item by themselves and will need to report the item to the moderator for it to be deleted. You can sent reports to the moderator regarding a number of issues (not only to request that an item be deleted). The procedure for sending reports is described in section 2.10.6. Item: undo edit, report to moderator, delete item; get link to item.